Lean management techniques cut waste and incorporate problem-solving tools to get the most out of technology’s potential. Today’s economy has increased the pressure on an already ailing health system, and many hospital administrators are seeking ways to reduce spending and costs. Many believe investing in healthcare technology, such as EMRs, may help streamline operations and reduce costs. EMRs offer many incumbent benefits—better, consistent access to patient information plays a critical role in improving outcomes. However, technology and software solutions are frequently top-down approaches that impose a work standard on a healthcare practice that fails to take into account local culture, patient needs, and workforce involvement in selecting and applying the most appropriate solution. If the technology is not supported with well-conceived processes, hospitals may invest in complicated and expensive technologies that create more waste in a system already fraught with inefficiency. Technology is only as good as the processes it supports. Before making large investments, healthcare providers must work with vendors from the early planning stages to identify and eliminate waste in processes that involve the use of EMRs to ensure positive outcomes. Lean management is a valuable tool to meet this objective. “Lean thinking” is a term coined by Massachusetts Institute of Technology professors to describe Toyota’s incredible success. It is now being used in several industries, including healthcare. Lean-thinking healthcare organizations are patient-centric organizations that relentlessly define value in the eyes of their patients (not clinicians or administrators) and seek to identify and eliminate wasteful work elements from every aspect of their enterprise, both clinical and nonclinical. • Growth: Lean transformations depend on creating growth, which accelerates productivity gains and absorbs the liberated human, physical, and working capital capacity. • Involvement: A successful lean transformation relies on the active involvement of the entire organization, led by the senior leader. This is critical to creating a culture that becomes a competitive advantage. • People: In any change effort, there will be individuals who do not want or are incapable of making changes. These individuals must be dealt with fairly and firmly. Expectations must be clear and understood, and people must be held accountable for results. • Management: Change takes place in daily steps. Management systems and habits need to be changed and rebuilt through the implementation of new principles and tools. A high-performance organization begins to develop with strong daily management. • Leadership focus: Strong and active leadership is critical to successful change. Business units become focused on delivering clearly defined, compelling value to their customers. • Economies of flow: The principles of lean make “economies of scale” obsolete. Highly productive cells and small, simple assets create low cost through flow, not volume. Through the Rapid Improvement Process, processes become cells, people become teams, and products and services evolve into value streams. • Results: Senior leaders may work with a consultant or designate a “lean team” within the organization to manage the process of transformation, providing feedback and structure to the transformation process. Lean management helps identify technology and software solutions that deal with the elimination of non–value-adding work (ie, anything that does not add value to the patient). Lean techniques help to “right size” equipment and computerized solutions to implement them in the shortest time possible, while minimizing risk and driving out waste. Providers should consider utilizing lean practices in these four areas to guide successful EMR deployments. Before implementing any EMR system, it’s important for IT administrators to fully assess the initial state. This begins by identifying all the steps necessary to satisfy patient needs. By using the proper tools, techniques, and principles, one can identify existing waste and begin to evaluate alternatives to create a more robust process. Without a proper understanding of the current workflows, organizations often try to overlay technology on bad processes. This can often cause more harm than benefit. After assessing the current state of patient flow and record keeping, providers should turn their attention to the top priorities they hope to achieve through a new EMR system. The technology should enable a target state that focuses on improved patient safety, quality, flow, and overall experience. As an “enabler,” it should not dictate the new processes but rather enhance them. To ensure EMRs do not create more work than necessary, it is important to determine when, how, and by whom the system will be updated on an ongoing basis. If EMR management is not predetermined, the organization runs the risk of having variation in how information is entered, which will be detrimental to maintaining consistency across patient records. The EMR infrastructure should be designed so it can be altered as pitfalls are noticed or new pieces of information need to be collected. The ultimate goal is to deploy EMRs in the least wasteful way and provide staff with technology that supports efficient processes that lead to better patient outcomes and a better bottom line. By being better prepared, healthcare organizations will go a long way in ensuring the most suitable EMR system is selected when the time comes to make purchasing decisions. Twenty-five percent of all Denver residents, or approximately 150,000 individuals, receive their healthcare at Denver Health, the largest integrated health system in Colorado. Denver Health began its lean transformation more than five years ago and has achieved impressive results. When the health system decided to implement an EMR system for bar coding medication, the IT department implemented lean management to help standardize workflows. The lean management coach (sensei) worked with Denver Health staff to identify all possible patient “flows” (how a patient moves within and between departments) that would be affected by an EMR system for bar coding medications. The staff determined the technology would need to account for multiple, standardized workflows for 14 units. These 14 units had no consistent processes for how patients moved, let alone how the information was transferred as the patient moved. Past experience indicated that if the EMR was allowed to dictate patient flows, the new processes might not be in the best interest of the patient or clinicians. Denver Health began a weeklong “Rapid Improvement Event” to develop one standardized workflow to cover all 14 units. During this process, the sensei leads selected hospital staff, administration, and patients in an intensive forum in which new ideas on how to eliminate waste are trialed and put in place. It begins with an overall assessment of the current state as it relates to various flows of patients, information, and materials. By using a cross-functional team of experts that work in each area combined with appropriate customers and stakeholders, the team was able to identify the method that would give it the best possible chance of success. 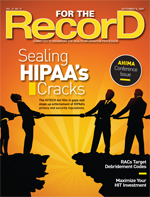 Denver Health then had the confidence to overlay the EMR system to help further enhance the technology’s effectiveness. Hospital officials were confident the new system would now be of great benefit and allow staff to track medical records in a more structured, yet agile environment. The result of developing a common workflow for the new software allowed for a quicker and more error-free implementation of the entire bar-coding system. In fact, the project was completed nearly two months ahead of schedule. — Mike Chamberlain is president of Simpler Consulting North America and general manager of Simpler Healthcare. According to a recent article published in The Journal of the American Medical Association, any process, whether it is treating patients or building cars, is susceptible to eight common forms of waste that are often roadblocks to optimizing a process. 1. Overproduction: refers to anything that produces unnecessary work/process steps that add time, increase cost, and drive variability into any process. These include making photocopies of a form that is never used, providing copies of reports to people who have not asked for them and will not actually read them, and using “cc” on e-mails. 2. Waiting: refers to idle time when no value is being added to a process. These may include patients waiting to see their physician or on the phone to schedule appointments, early-morning admits for surgeries that won’t be performed until later in the day, waiting for office equipment (computer, photocopier, etc) to be repaired before being able to work, and waiting for a meeting that is starting late. 3. Transportation: waste involves delays in moving materials or unnecessary handling of patients, staff, or materials (for example, moving individual files from one location to another, moving supplies into and out of a storage area, and moving equipment for surgeries in and out of operating and procedure rooms). 4. Inventory: wastes are capital investments, stock, or corresponding control systems that do not yield profits. These may include office supplies in hallways, expensive clinical supplies and implants that can be ordered on a just-in-time basis, and unnecessary instruments in operating room kits. 5. Motion: wastes are movements of providers or equipment that do not add value to a process. For example, when physicians and nurses leave patient rooms for common supplies or information, valuable time is expended unnecessarily. 6. Processing waste: involves unnecessary work/procedures that generate information to be discarded. These may include redundant capture of information at admission, multiple recording and logging of data, writing by hand when direct input to a word processor could eliminate this step, and patients waiting for preapproval of urgent treatments. 7. Defects: are incorrectly performed work elements and outcomes, often discovered by non–value-adding inspection. Examples include fixing errors made in documents, mistakes caused by incorrect information or miscommunication, errors in or misinterpretation of handwritten orders, and sending out bills with an incorrect address. 8. Unused human potential: refers to the failure to utilize members and their problem-solving skills. For example, healthcare professionals may be placed in the wrong role working on non–value-added work that does not take advantage of their talents.